Every business has something to sell or promote, because that’s what a business does. No matter the size, there are startups that sell apps, companies that sell detergents, others that make and sell pizza, and some offer consulting services. Let’s say you are new to this, and you just have an idea of a new product. Great! Now you must answer a tough question: who needs this? Is there a gap that you can fill, are there needs that people can’t solve with the current offers on the market? Don’t worry if you can’t answer this question right now, most businesses spend a lot of money to understand what people need and who to sell their products to. If you plan to open a new restaurant It’s not enough to say ‘ok, I will sell pizza to people that are hungry’. Because people can go to the other Italian restaurant that already has a good reputation and loyal customers. Most businesses don’t make it. 8 out of 10 new businesses fail within the first 18 months. Will your startup be there selling pizza or will it close within a month because nobody will come to eat? Or maybe you already have a business: a small bookshop, an online shop selling baby products or why not, a SPA? If you do and have just an idea of who your customer is, then you really need to read this. You need to understand what a Customer Persona is and why it’s a good idea to start focusing on this. So who is going to buy from the new restaurant (ex. teens vs. adults? ), what they will look for (ex. classic pizza vs. new crazy recipes? ), how they will buy (ex. on-the-spot vs. home delivery?. ) and why will they come to the restaurant (ex. family lunch vs. dating?). If instead you already have a business that’s doing well, just look at the figures. Try to see who are the customers that bring most value, more ROI. If you have that bookshop, see who are the customers that spend more on books, write this down, then try to fill in the question boxes from the above template. What you should know is that all this research, thinking, time consuming activities – all this should start with the customer in mind, and what they need so you and your product can fill that gap. It’s so much more expensive launch a new product in a cluttered market, and it’s almost impossible to convince a customer already using the biggest, most reliable brand on the market to buy your product. In the end, would you? Would you give up your current brand of shampoo, your watch or coffee for a new product that you don’t trust, know nothing about and most likely you haven’t heard of? Because another thing to remember – no matter how big the budget, you can’t possibly reach every person out there. Let’s get to work then! The most common error most startups and small business make is not that much in realizing how important and why they need to have customer personas developed, but delaying this process . The most common excuses are: “we don’t have a marketing department yet, we’re just a startup..” or “yes, we need to have this, we’ll do this next week” and the next, and so on. Indeed someone needs to take care of this and to allocate resources in terms of person responsible and budget (aka. the time a skilled marketing member of the team or freelancer will take to help you with this – working with freelancers is the latest trend in digital marketing because A) small companies can’t afford a permanent employee for marketing and specifically for digital marketing, and B) It’s takes less time and no questions asked if you want to stop working with a freelancer tomorrow). Alexa to research competitor’s web analytics, such as traffic and visitors versus average (benchmark with other website or your to see what they’re good at). SimilarSites to find your competitors if you have doubts or just feel the need to be 100% in control and have all the data. You can also find information about what organic keywords visitors use before they go to your competitors and what paid keyword they use, or where they’re coming from. SEMRush – perhaps this should be your first step. With SemRush you can research live your competitors, see their organic and paid search strategies, the keywords that perform best and you can have in mind when you’ll do your own keywords research. Google Keyword Planner: #1 keyword research tool out there, and free to use. With Google Keyword Planner you can see what keywords perform best and are not that cluttered, meaning your competitors don’t use them as much and your costs with search ads will be lower. You can also find out what niche to address, this is a great tool to use to find what people are searching online and don’t find that much. Awesome! But all the information needs to support or confirm an already sketched consumer understanding infographic (you can use the chart above and complete it for each buyer segment you think you’ll sell your products to). It’s actually what you call the ‘qualitative’ part of the customer persona building process, imagine gathering some friends and acquaintances in a room and have a discussion quide, make them answer to questions, such as: “what brand of X do you use?”, “why you buy it?”, “what you like/don’t’ like about the brand you use?”, “would you be willing to try a new product?, give a sample of product to them and ask for reactions. It’s like a focus group or individual interview, but if you’re a startup and don’t have that many resources just go ask people around you what they think! After this write everything down, and here’s where the more difficult part starts: you need to let go the fact that you’re the owner and perhaps pay even more attention to the negative reactions of the people. Understand what and why they buy products, and then group them depending on their needs. For example: some people will buy a brand of shampoo because it’s cheap and they don’t feel they need something special. Others will seek an anti-dandruff shampoo, while a third customer persona would be the natural products buyers who seek for herbal shampoo. Notice the customer persona from my example above: the Price Sensitive type, the Medical Problem, and the Herbal customer persona. Again, it may seem piece of cake and logic analysis, but it’s not. And most companies pay a lot for development of customer persona, because this research then needs to be confirmed by data (how much of the market represent the Price Sensitive seekers? How important price will be for overall sales?). 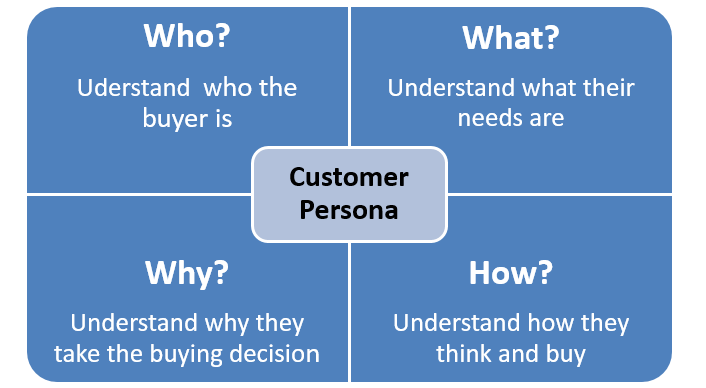 How much to focus on developing a customer persona? Well this depending on the size of your business and the investment you make ask. On the digital space you will find many free other resources you can use for research and competitive analysis, and there we are here to help if you don’t have the necessary resources and people for an in-house effort. To build a customer persona is probably the most important step and it should be done, at least basically, before the launch of a product, website, service. Then optimize, optimize, optimize! Redo the above part at a lower scale at least every year because people change, buying habits change, new competitors appear and you will see how much these changes affect your business.